Ahmedabad. 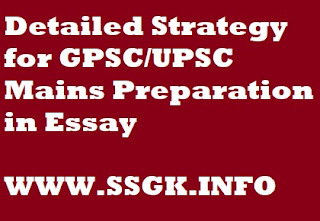 I, fortunately, cleared GPSC twice, 2014 and 2016.
inquiring about strategy for Mains Examination. •Having Good score, Now From where to start for Mains? •What to read for General studies? •Any Good book/Sources for Ethics and Pub. Ad.? •How can I Score well in Essay? •What about Answer writing practice and paper checking? •How to fetch more marks in Gujarati and English?